We hope you’re enjoying your weekend. Today’s episode is the third installment in our four part The Amen Solution Q&A session. Enjoy your weekend treat. Brad:	Hello, Dr. Amen, my name is Brad. I have a technical question. For people with severe inflammatory conditions, such as osteoarthritis, that seem to interfere with their metabolism and losing weight, what specific protocol would you recommend for them? Dr Daniel Amen:	Okay, so for people who have inflammation, and it's a lot of people. In fact, many people think it is the primary cause of Alzheimer's disease and is involved in depression, along with heart disease, high blood pressure, diabetes, cancer, and so on. The first thing is, stop sugar. It's the very first thing. No sugar, because sugar is pro-inflammatory. More fruits and vegetables, more fish, get rid of processed foods, things like food additives and food dyes. Fish oil is very helpful because fish oil is anti-inflammatory. In our clinic, we often do a test called the AA-EPA ratio. It's the ratio of Omega-6 fatty acids to Omega-3 fatty acids. Omega-6 fatty acids, you'll find them in things like corn and soy, they're called fall fats because they kill you early. They increase inflammation. Omega-3s are called spring fats, because they add life to you. When we do this test, unless someone is really focused on a healthy diet or taking fish oil, their test scores are just horrible. Diet, taking fish oil, sometimes SAMe can be very helpful as well. Let's be smart. Let's do it with food first. Jerry:	Hi, my name is Jerry. My question is two-fold. First, what is the best way to really accurately know one's brain type? The second is, does that brain type change from time to time or situationally in your life? 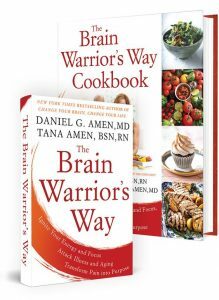 Dr Daniel Amen:	The best way for people to know their brain type if they don't get a scan is to take one of the questionnaires that I've developed, because I've seen, okay, it's these symptoms that tend to go with this type. Now, as we age, lots of things happen to us. If we go through a divorce, maybe before I was never compulsive, but now I've been traumatized. Talked about in the show about that diamond pattern in the brain, and part of the diamond is the compulsive part of the brain. Trauma can change your type, emotional trauma. Physical trauma can also change. You go through a car accident or you fell off a ladder, fell down a flight of stairs and hurt your frontal lobes. Now all of the sudden, you're impulsive where you might not have been impulsive before. Your life can clearly change your brain. Victoria:	Hi, my name's Victoria. Would you ever recommend medication or is there always a better way, such as for anti-anxiety? Dr Daniel Amen:	I often recommend medication. It's just not the first thing I do. Given my ambivalent relationship with medicine, it really helps some people, it hurts other people, in my mind, I think, can I do this naturally? If I can't, well, I'm pretty good at using medicine, so if I have somebody who's got manic-depressive illness or bipolar disorder, I'm going to be thinking about decreasing the sugar in their diet, increasing the Omega-3 fatty acids. If they're psychotic, I'm going to put them on lithium and Abilify. I always want to do what's the right thing for my patient. I'm not opposed to medicine. I'm just opposed to the indiscriminate use of medicine. 85% of psychiatric meds are being prescribed by non-psychiatric physicians, often in a seven-minute office visit. You come into your primary care doctor and you say, "I'm sad, I'm anxious, and I can't sleep." Within seven minutes, and I've seen this happen repeatedly, they leave with prescriptions for Ambien, Xanax, and Lexapro. No one's talked to them about, "Do you know how to correct the automatic negative thoughts in your head? Do you know how to breathe with your belly, do you know how to meditate?" It's like, "Really? There are other things I can do?" Let's be smart about this. Carla:	Hi, my name is Carla. I have a question about working with two separate populations, trauma recovery and the other population I work with is teaching couples how to fight without killing each other. Sometimes those can overlap. My question is, when I'm working with both of those populations, are there foods that I should encourage them to eat or not eat before they come into session and work with me? Dr Daniel Amen:	It's a marvelous question. What I would say is before they come in to your session, know what their type is. Typically, if you have couples that fight, my experience, you have a wife that can't let anything go, her brain is like a little mouse on an exercise wheel, and the mouse can't get off, and she's chewing on that things that's upset her, over and over and over again. Dr Daniel Amen:	Yes. Give her a cookie. Carla:	Give her a cookie. Dr Daniel Amen:	Give her carbohydrates. Dr Daniel Amen:	I was kidding with the cookie, give her an orange. 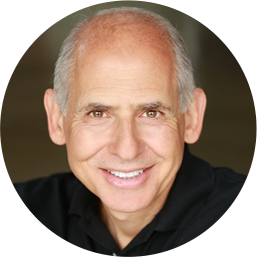 Dr Daniel Amen:	When you use something like an orange, it raises serotonin in the brain and helps the little mouse sit on the couch and not worry so much, but if she's married to an ADD guy, who's late, who can't pay attention, who's distracted, who's conflict-driven, give him protein before the session. What I really want to say is, one diet doesn't work for everyone. You have to know their type and then you can develop dietary recommendations based on their type. Now, if you just want to go, okay, what's the diet that works for everyone? I go, there isn't one, but follow the rules that we talked about. High quality calories, water, lean proteins, smart carbohydrates, healthy fats, eat from the rainbow, and brain-healthy herbs and spices. I think of a nice balance of those things. If you're more compulsive, more smart carbohydrates. If you're more impulsive, more protein. Just while I'm thinking of it, how we feed children is a scandal, because we give them these sugar bombs, and then we tell them to concentrate. Depending on the child's brain type, we need more protein especially early in the morning. Carla:	Okay. Let's say I'm working with this couple, and overlay that with post-traumatic stress disorder. If I'm working with somebody specifically with PTSD, same question, what foods should I feed or not feed them? Dr Daniel Amen:	Tell them please don't go on the Atkins diet, because people with PTSD get stuck. They get the same thought in their head over and over again and they can't let go. Part of the diamond is an area of the brain called the anterior cingulate gyrus, which is where people get stuck on things. They often have low levels of serotonin. You go on the Atkins diet or you go on a high-protein, no-carb diet like I mentioned in the show, you will focus better on the things that upset you. The kind of diet really does matter. There's actually a very interesting diet from researchers at MIT called the Serotonin Solution Diet. It teaches people to eat carbohydrates as a way to settle down their brain. It's brilliant, for one of the types. That's the problem with all these diet books, is they don't take an individual's brain into account. 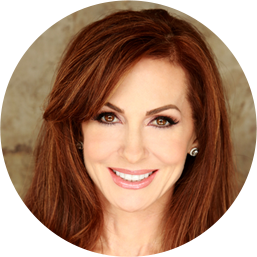 Carla:	There is no one diet for trauma recovery? Dr Daniel Amen:	The answer is yes, there is no one diet for trauma recovery, but I would be thinking that you want to do something with carbohydrates for them to help settle down their brain, but it's not ones that are addictive.